Luperci are capable of utilizing a wide variety of resources to construct, craft, and otherwise create unique items for use. This guide serves as an introduction to materials available to Luperci, and to advanced topics such as metalworking and glassblowing. Humans left behind a lot of things that Luperci can use. It’s shorter to list things they cannot use. For a non-inclusive list, see the Post-Apocalypse page. There are some less obvious items you might consider though. 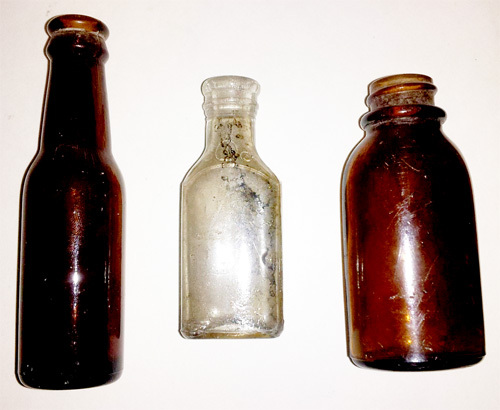 For example, Luperci are able to use some very stable, non-reactive human chemicals, liquids, and other materials, provided they find it well-preserved and stored (e.g., alcohol, glow paint, powdered laundry detergent). However, while they are able to use these compounds — they may not know they are toxic in certain applications (like eating paint), or how best to use them (the first Luperci to mix detergent and water is in for a surprise!). Many of these compounds are very rare for Luperci. If a use is discovered widely amongst Luperci for a given compound — liquor, for example — it becomes increasingly difficult to scavenge due to other Luperci passing through the area to loot and scour. Some compounds (e.g., paint and powdered detergent) are not possible for Luperci to create on their own except in extremely primitive forms, so once the remaining human stores are gone — that’s it! Such compounds, if especially useful, would therefore be extremely valuable to Luperci. 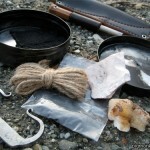 Catgut can be used as a string to tie many things together. Luperci can use essentially any animal, vegetable, or plant product that does not require advanced synthesis. For example, harvesting coca leaves for chewing is okay, but producing cocaine from coca leaves is not. 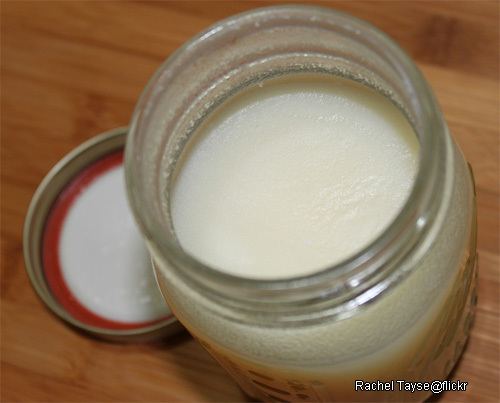 Tanning hides and making tallow candles are among technology possible for Luperci. Natural products are not necessarily accessible to Luperci in a given area though — coral is hard to find in eastern Canada! 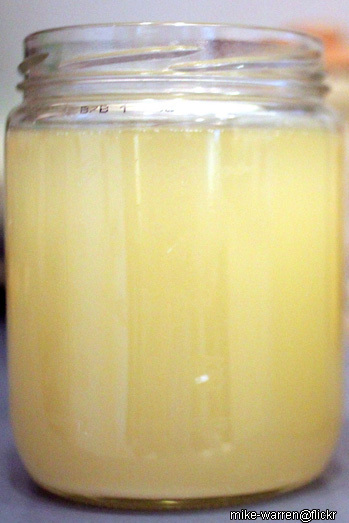 Animal products include but are not limited to animal glue, catgut, gelatin derived from boiled cartilage, animal milks, coral, feathers, animal dyes, eggs, various glandular products, various animal hair products, hides, whale products, animal fat products, animal waste products, and even insect products. 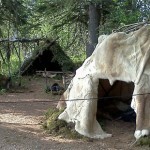 Hide tents would be very useful for traveling or nomadic Luperci. 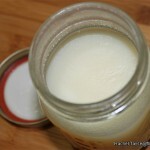 Animal fat is a useful compound in many aspects. 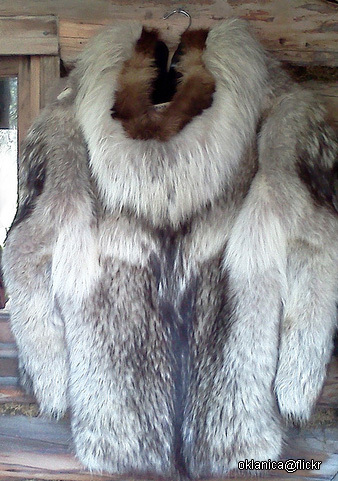 Thick fur coats may help non-native species — such as Jackals — survive in cold parts of the world. 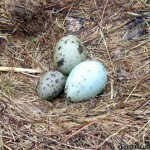 Bird eggs are a useful source of food for many canines, whether cultivated in livestock or harvested from the wild. 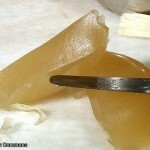 Animal glue is an adhesive produced from animal products. It would take Luperci a very long time to chop as much wood as is pictured here. Wood is an abundant natural resource in Canada. 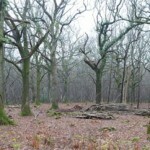 Many areas are untouched wilderness, forested prior to the demise of humanity. Still other areas, formerly occupied by humanity, have sprouted with saplings and young growth. 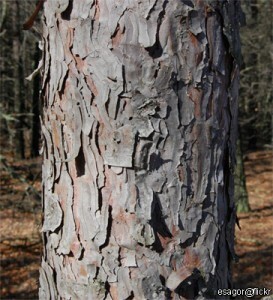 Examples of naturally harvested tree and plant resources include charcoal, birch tar, pine tar, tannins, pitch, potash, willow bark, birch bark, birch syrup, and maple syrup, not to mention various sealants and protectants, gums, sugars, saps, latexes, tars, oils, waxes, spices, nuts, roots, berries, and other tree fruits. Processed products from plants include various medicinal compounds, dyes, baskets, structural and building materials, jewelry, weapons, furniture, storage, construction, art, crafting, medicine, firewood, and tools. 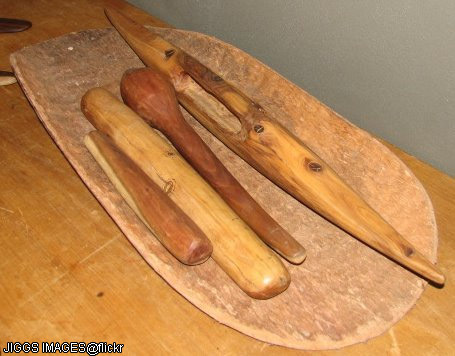 Stone and wooden tools are among the easiest types for Luperci to craft. 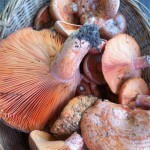 While many mushrooms are delicious and beneficial, still others are highly toxic. Luperci can harvest wood, though it is a painstakingly slow process in many cases. 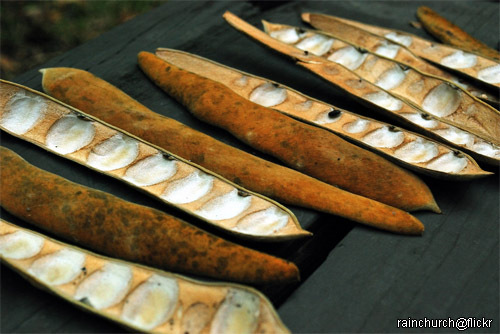 Seed pods can be used to cultivate more plants of a certain species. 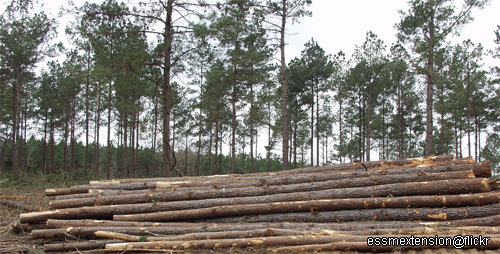 Luperci would not be able to cut wood as finely or as straight as pictured here. Wood is a highly versatile material, capable of being shaped in many ways. 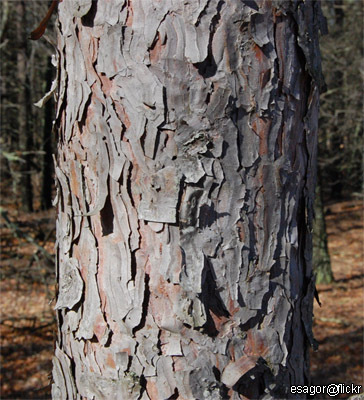 Tree bark is useful in a large number of applications, from construction to medicinal. Remember that there are different types of wood. Not all wood is good for all things. See the Flora Guide for further information about trees and wood. 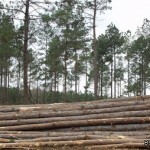 Just as there are different types of trees that yield different types of wood, some trees may be only partially usable due to rot, knotting, poor growth, etc. 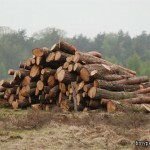 Wood needs to be chopped and harvested from trees, obviously. Chopping wood is an intensive activity for Luperci, just as it is for humans. It’s not very energy-efficient, and tools capable of bringing down trees are more scarce for Luperci. Gathering deadfall does work, to some extentm just remember — vast quantities of useable wood are not just lying around in abundance. Wood also needs to be hewn into the correct shape (sometimes doable with simple tools, sometimes requiring a lathe or similar). 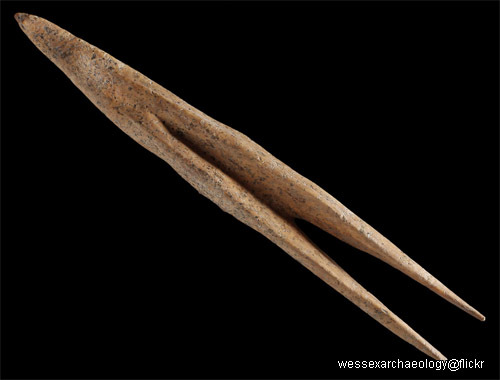 This can be very dangerous — chunks of wood can fly off and spear a canine in the eye, and inhaling sawdust is not healthy (though note — most Luperci are not likely to know this!). Sawdust can also be combustible. Wood intended to be touched frequently (e.g., furniture) or stood upon (e.g., flooring) should be sanded and protected with sealant. 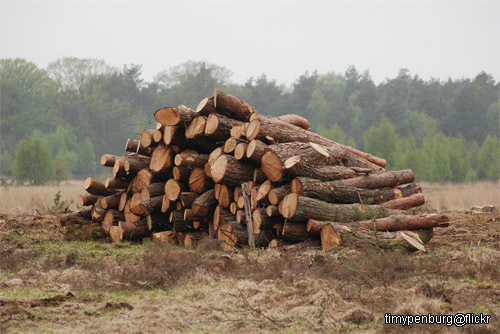 Wood intended to be placed outdoors should be protected from weathering and insects. Bone can make a piercing arowhead. 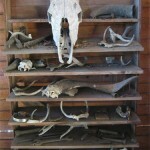 Bone is an abundant natural resource, occurring in a wide range of wildlife. 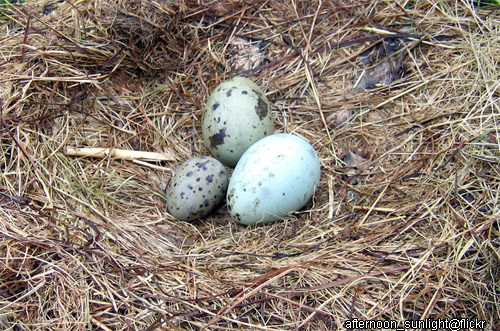 It requires harvesting (typically from prey or carrion) and can be shaped to most forms by carving, polishing, and sanding. 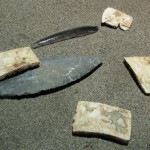 Bones from some animals are hard/thick enough to serve as arrowhead material. 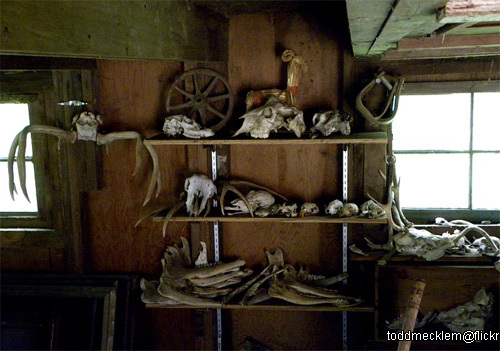 Any part of the skeleton can potentially be utilized; however, antlers and long bones provide some of the best working material. 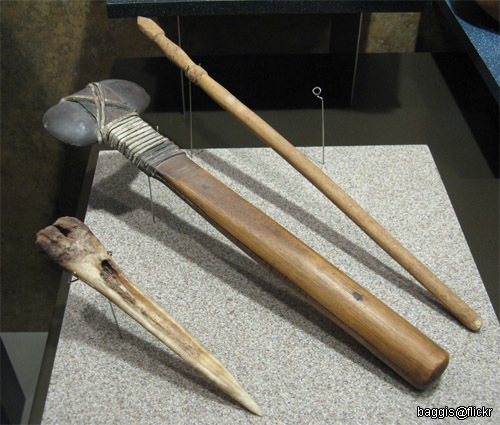 Bone is often used for jewelry, weapons, construction, art, crafting, and tool-making. 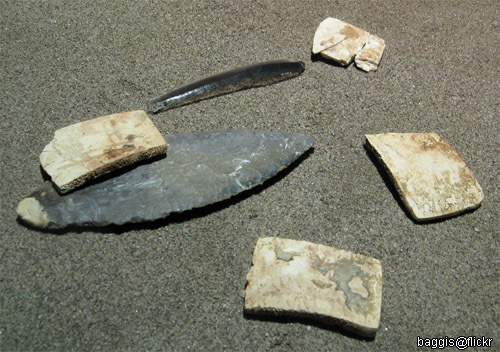 Bone fragments can also be shaped, by scraping against an abrasive stone, into such items as arrow and spear points, needles, awls, and fish hooks. 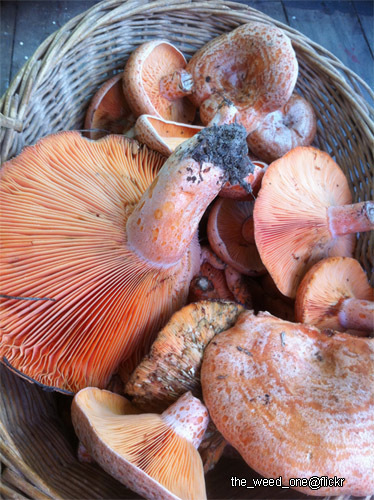 Other products which may come from bone include bone char, bone meal, and neatsfoot oil. 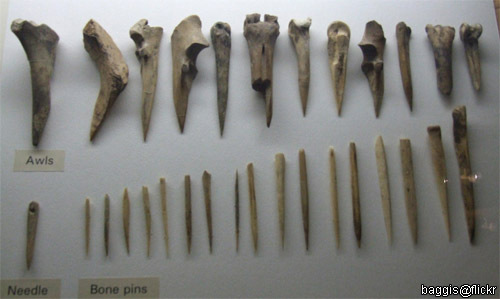 Bone is easily shaped into a number of useful objects. Bones are a natural material that can be found in abundance — especially for predatory Luperci. 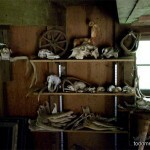 Bone can also be used for jewelry and other essential crafting. 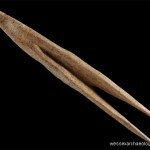 Bone, a widely accessible, easy material to work with, is common in Luperci tool-making. 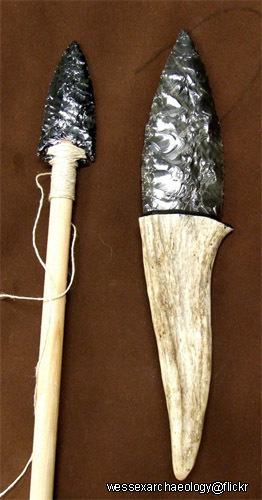 Luperci are even capable of beading objects — here, colored bone decorates a handle. 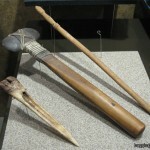 Bone and stone together can make weapons. 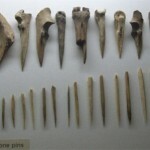 Bones can be shaped into many useful tools. Bones should be cleaned and the marrow removed. 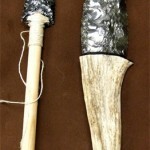 Carving a bone pulled from hours-dead prey is not realistic. Remaining grease, oils, and any excess meat must be scraped off. There are many methods available for cleaning bone — soaking in water or vinegar, using ants or beetles, or simply sun-drying. Sanding bone down can result in many fine particles. As with sanding and shaping wood, it can be very dangerous in confined spaces without ventilation (though again, most Luperci will not realize they are accumulating the slow damage of inhaling fine dust until symptoms begin appearing). Slate may be very useful to Luperci as a soft stone. 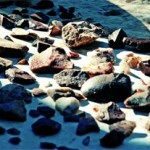 Stone is an abundant resource. Masonry — construction using individual, small units of hewn stone — is commonly for the walls of buildings. Masonry is generally a highly durable form of construction, but the materials used, the quality of the mortar and workmanship, and the skill of assembly can significantly affect the durability of the overall masonry. 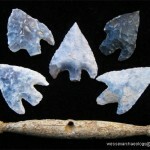 In addition to building, stone can be used for stoneware, jewelry, dishware, beads, vessels, weapons, crafting, and art. 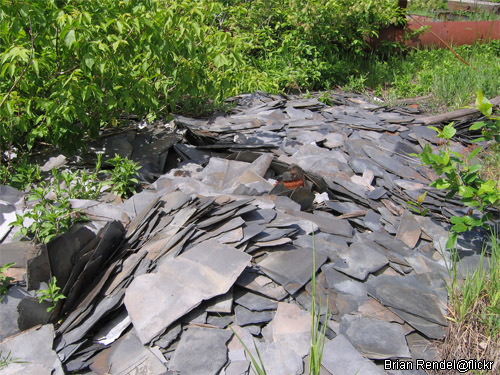 Raw stone can be found around eastern Canada in abundance, of course, and various stones types include: sandstone, limestone, basalt, shale, coal, gypsum, anhydrite, granite, gneiss, schist, greywacke, marble, quartzite, gabbro, granodiorite, and diorite. 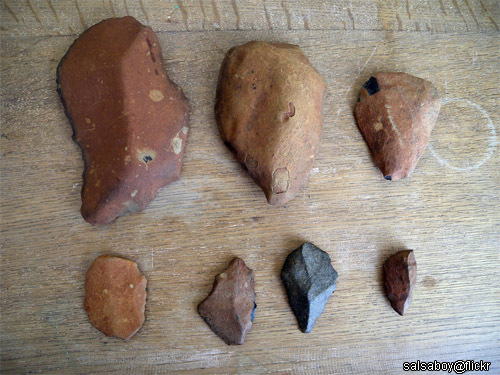 Stone fragments are easy to find everywhere, as one might guess. Stone can be hewn into many shapes. 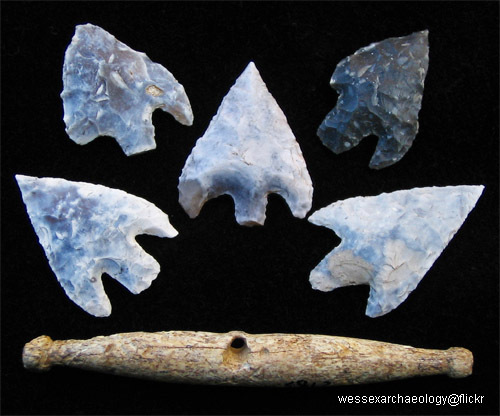 While stone knives are not as sharp as metal, they can be crafted far more easily. 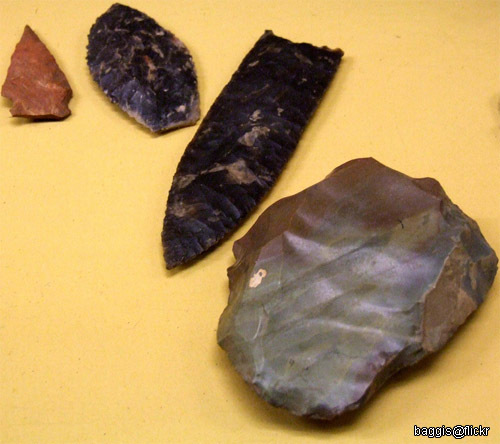 Stone tools wear down quickly in many applications. Stone can be sharpened into a deadly point. Some forms of stone are too porous or too hard or too soft or too slippery. 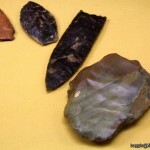 Some stones can be edged very sharply (e.g., obsidian — more a glass than a stone), but many stones will retain a primarily blunted edge. Do your homework as to what kind of stone should be used for your purpose! 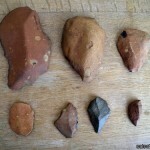 Stone is chipped and shaped into the desired form with harder stones or metal objects (e.g., a hammer and chisel). Abrasive techniques (e.g., grinding pieces off of the stone) are also possible, given the proper tools. It is obviously not possible for Luperci to produce perfectly square stone bricks. 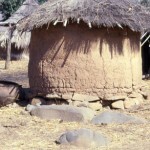 It is also an extremely tedious process for one, or even a few Luperci, to craft enough stone bricks to build a house. Scavenging these items, as they can be found in abundance in both rubble and standing buildings, is far more common, but regardless, transport may prove challenging! 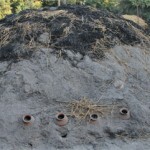 Very primitive clay kilns can be created in huts. 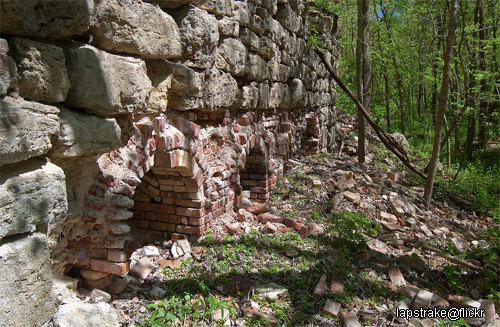 Pottery kilns were used to heat and fire clay, forming its hardened exterior. Not all pottery kilns are fancy — ground-firing is possible. 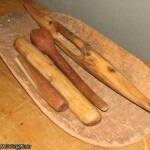 Clay is abundant and, although requiring a kiln, is easy to work into useable shapes. Clay is abundant near the coasts, along rivers and along the shores of some lakes. 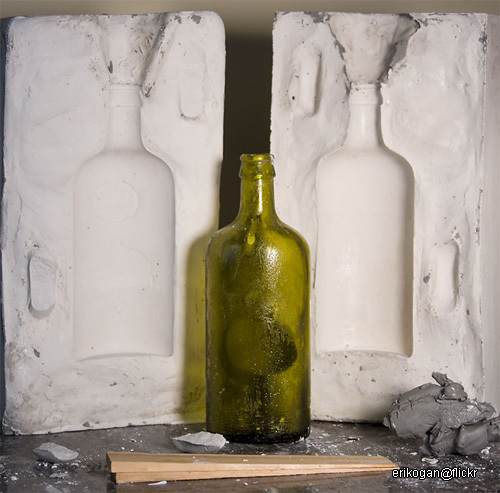 Clays exhibit plasticity when mixed with water in certain proportions and become firm when dry. 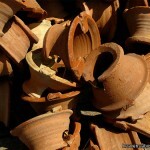 When fired in a kiln, permanent physical and chemical changes occur, changing the clay into a hard, ceramic-like material. Different types of clay, when used with different minerals and firing conditions, are used to produce earthenware and stoneware. Clay can be used for pottery, cooking pots, dishware, art objects, clay paints, smoking pipes, and even music instruments (e.g., an ocarina). Clay is also used to create brick and in structure-making — clay is used in adobe, cob, cordwood, and rammed earth structures and building elements such as wattle and daub, clay plaster, and clay flooring. 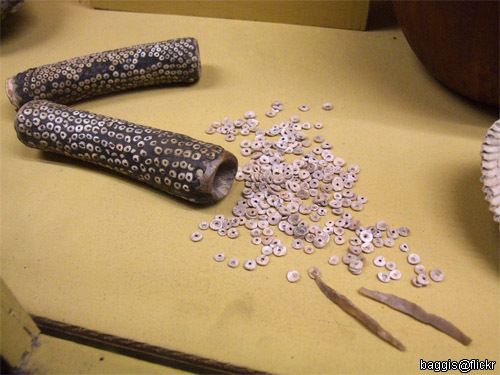 Clay tablets were used as a writing medium; clay balls were also used as sling ammunition. 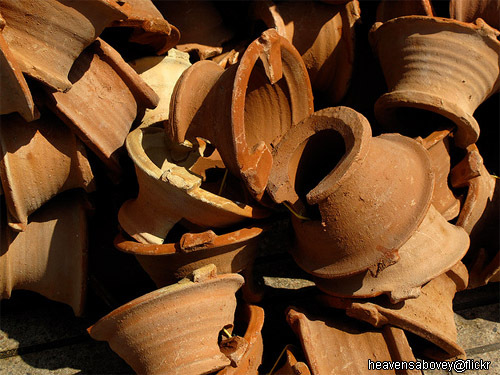 Clay can also be used for basic engineering, such as in diverting a canal or filling in land, and some have used it as medicine — ingesting small amounts of clay to soothe upset stomach or bowels is an ancient remedy. Clay must be gathered, and depending on the source location, this can be dangerous. The Bay of Fundy is abundant in clay and silty materials, but the tide does come in, and in places the silt at the bottom of the bay is permeated with water and is not solid, walkable land (i.e., it’s easy to sink in and get stuck in the mud!). Clay should be dried. 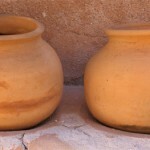 In eastern Canada’s damp, often cloudy climate, the proper drying of clay can take a very long time. 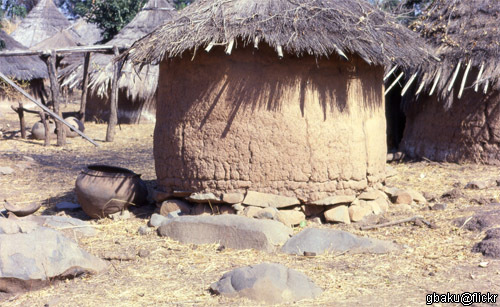 Alternative methods of drying include the ancient method of pit-firing, saggar-firing, and kiln-firing. 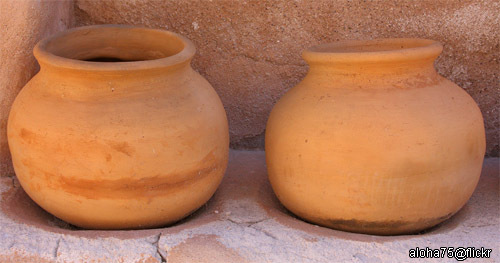 Fired clay requires glazing (coating with enamel — wax can be used, among other substances). If clay is not coated, it remains porous, and is not suitable for long-term storage of liquids. Warning! 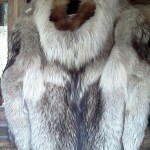 The technology and materials described herefter are the bleeding edge of Luperci technology. Luperci are capable of working with and crafting items from glass and metal. However, the techniques and technologies required for glass and metalworking are some of the most advanced available to Luperci. The technology discussed hereafter is found primarily in Eurasia and North Africa, the most developed areas of the Luperci world. Where they are found in North America, they are likely to be imported technologies and far more rudimentary. It is worth noting, too, that even the most advanced Luperci are not capable of the same production as humans. While they can make glass, they lack the precision to craft precise very specialized items like lenses (e.g., for telescopes); and while Luperci can shape metal, they cannot create huge steel beams or complex, specific components intended to work with other parts (i.e., machinery). As skills, these technologies — “metalworking” or “blacksmithing” or “glassworking” — are very broad subjects. 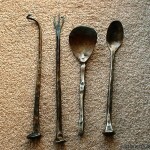 In the case of metalworking, this covers everything from mining metal out of the ground, to refining it, to shaping it. In the case of glassworking, this covers everything from gathering the requisite materials to combining them in the correct amounts to the fine art of blowing glass. These subjects are complicated, time-consuming, and difficult for Luperci to grasp and master. They require an individual to have working knowledge in geology and chemistry, among other things — even if they may not recognize the knowledge as such (a Luperci may just as soon decide two similar metals melt at different temperatures because one hadn’t been blessed by a god, as it would figure out that the two metals have different properties). In the end, the ability to work with glass and metals should require years of apprenticeship to really master. Not arrive in ‘Souls as Master glass or metalworkers without an appropriate history. 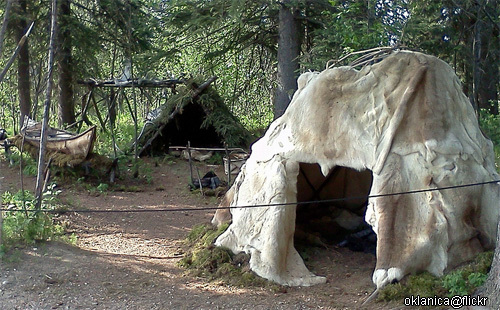 It is highly unlikely a skilled metal or glassworker would voluntarily abandon their forge, tools, and homeland to uproot and start over again in relatively backwater and undeveloped eastern Canada. Have had no less than one year of practice to even begin metalworking/blacksmithing/glassworking on a proficient level. It is not realistic for a character with little to no knowledge of blacksmithing/metalworking to gain even “Apprentice” level knowledge in a period of less than a year. It should take many years (three or four years of age, if they’ve devoted literally their lives to the craft) to truly “Master” knowledge of these subjects. Characters who are younger than three or four years old should never be referred to as anything but apprentice metalworkers. Characters entering the game will need to spend substantial time gathering not only the required materials, but the other Luperci required to create glasswork or metalwork operations within ‘Souls. Have assistance with the many steps of these processes. The techniques discussed hereafter are absolutely not able to be undertaken by any less than a coordinated and cooperative group of Luperci (i.e., a pack). Single Luperci, small packs, tiny families, etc. will not have these technologies or resources available, regardless of location. Have accidents, mishaps, and mistakes. As with anything else, we’d like to see realistic mistakes and accidents occurring. Every sword crafted by a metalworker should not be perfect. In fact, it’s incredibly difficult to create a working sword — the metal must be flexible enough not to shatter when striking something, yet hard enough to retain an edge through long and bloody battles. That is not an easy skill to master! If your character is continually careless around the extremely hot furnaces required for glass or metalwork, an accident may eventually occur. Metalworking the wrong type of metal can even result in illness. Some of these mistakes/mishaps can be mitigated by research and care, but a metalworking Luperci should have a fair amount of experimentation and mistake-making — they are the bleeding edge of Luperci technology, after all. 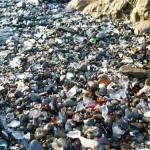 Glass that has been submerged for a while in the ocean is often cloudy and rounded. Luperci may not consider this the same substance as the sharp shards of glass found in human areas. Glass is a clear solid material, often used to create extremely sharp (albeit brittle) cutting tools, jewelry, dishware, various containers, marbles, beads, jewelry, prisms, and glassware. 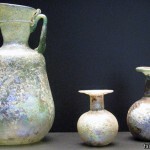 It is likely Luperci’s primarily interest in glass is as a useful material: i.e., for dishware, vases, etc., including trade-able material such as jewelry and beads. Although brittle, glass is extremely durable, and human-made glass items and containers may be found intact in well-protected buildings. Humans often used glass as a building material, traditionally as small panes set into window openings in walls, including stained glass. However, most Luperci probably wouldn’t care enough to craft windows: intact windows from humanity are incredibly rare, and Luperci live much of their lives outside anyway. It is unlikely that any Luperci will want to invest large amounts of time in trying to recreate windows for residential uses — especially because flat sheets of glass are difficult to manufacture, and themselves require the most advanced form of glass creation (glassblowing). 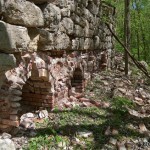 Limestone kilns were used to fire glass. Silica, which occurs in nature as quartz and other minerals. The minerals must be crushed into a fine sand — extremely time consuming for Luperci to do by hand — before being melted into glass. 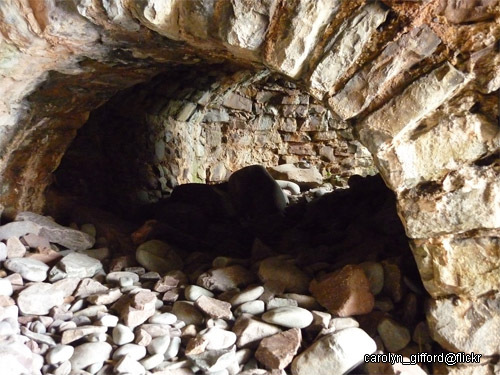 Quicklime, created by the burning of sand or extracted lime (a type of stone prevalent in Nova Scotia) in a kiln. Quicklime is a respiratory irritant that is capable of causing burns to the nasal passageways, abdominal pain, nausea, and vomiting. Although quicklime is not considered a fire hazard, its reaction with water can release enough heat to ignite combustible materials. Soda ash, readily extracted by burning salt-tolerant plant species: saltwort and glasswort plants are chief among these, though many plants produce soda ash when burned. There is also Natron, a naturally occurring form of soda ash which occurs in Quebec. 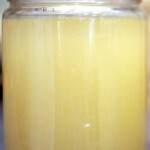 Color additives or opacity controls can be added or naturally present in the glass due to impurities. 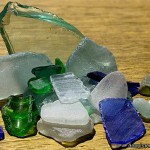 Alternatively, old glass fragments can be melted down and reworked. 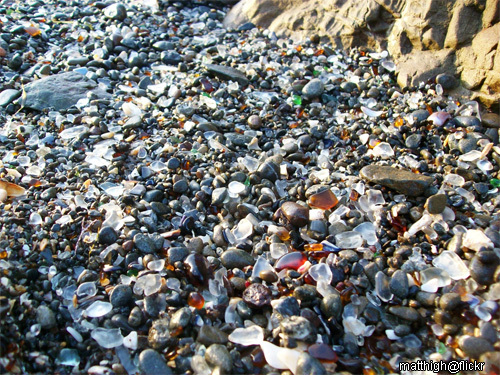 This can result in flawed glass, however, as it is difficult to determine whether all the pieces are of the same type of glass. 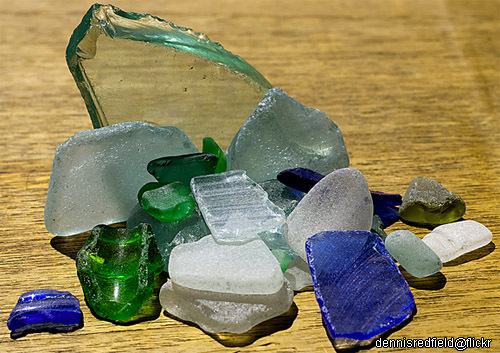 Beaches are excellent places to scavenge for glass. Note the imperfections in shape and form. Molten glass is obviously dangerous. Glass can be molded into shapes and forms. 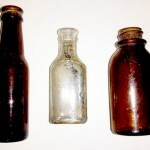 Bottles may have survived intact if buried. A batch of raw or scavenged materials is heated to a temperature where it is partially melted; the unmelted parts may be removed and washed of non-reactive components and added to the next batch to increase uniformity. This requires a vessel for the raw materials which which has a higher melting point than the glass — e.g., a steel box or an iron plate. 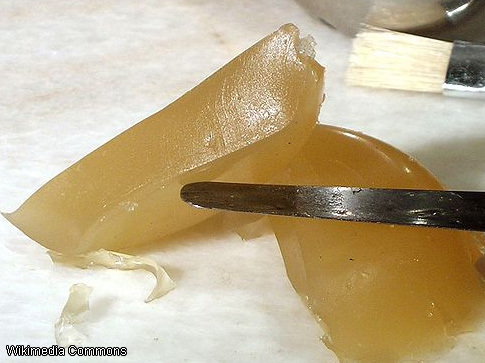 Glass melts from 1425° (C) / 2600° (F) to 1600° (C) / 2900° (F) — which is hotter than the average open fire can burn. 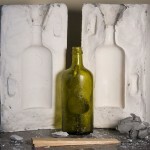 Glass melting thus requires a furnace or oven. 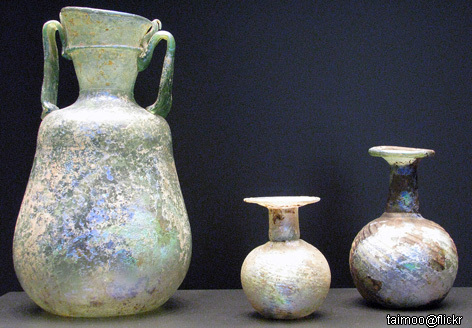 Vessels may be “core-formed” — produced by winding glass around a shaped core of clay over a stabilizer, then fusing it with repeated reheatings. The most advanced technology available to Luperci is glassblowing, and this technique is the only way to produce plate glass, albeit of poor quality. Advanced and modern techniques, invented after the industrial revolution, are not available to Luperci. For more information about the glassblowing process, including real life experiences, see this very helpful Help and Questions thread. Metals are solid materials that are typically hard, opaque, and shiny. Their uses are nearly endless, but frequent applications include tools, jewelry, weapons, armor, defense items, structures, dishware, containers, and mirrors. 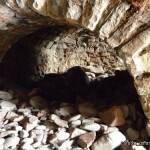 There are still existing mines where Luperci can obtain metals — Stellarton Mines, for example. Existing machinery would not work — Luperci are back to lanterns, pickaxes, and manual labor. This is a hideously tedious process for a single (or even a small group of) Luperci to undertake. When mining, you get an ore. An ore is a type of rock that contains minerals with important elements, including metals. Ores contain useless junk rock as well as the desired metals, and must be refined to extract the valuable element(s). 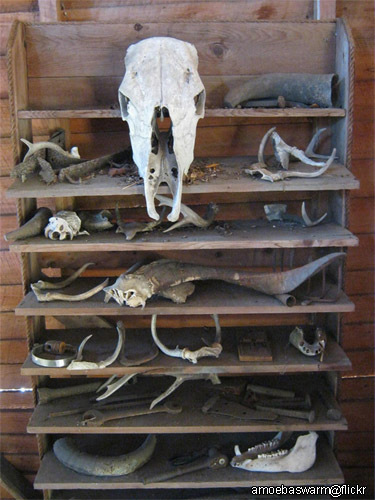 A much easier option is taking old human artifacts and melting them down. When scavenging, generally alloys are found, as they are most common in human application. An alloy is a mixture or solid solution composed of a metal and another element. 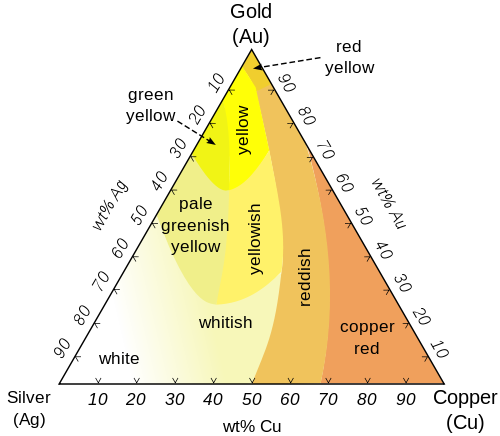 Humans used pure-form metals less frequently than alloys, but many metals occur in nature in pure form (e.g., gold). Smelting extracts metal from ore. Smelting uses heat and a chemical reducing agent (commonly a source of carbon such as coke or charcoal) to decompose the ore, driving off other elements as gasses or slag and leaving just the metal behind. As most ores are impure, it is often necessary to use flux, such as limestone, to remove the accompanying rock gangue as slag. 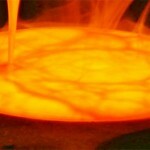 Crucibles are containers that can withstand very high temperatures and are used for metal production. 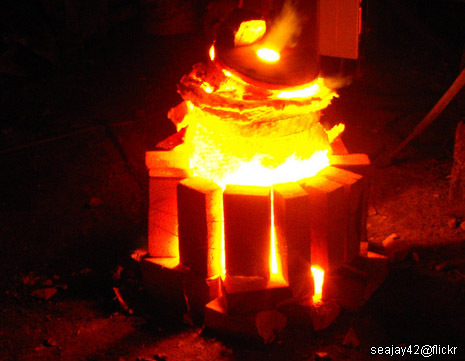 Crucibles can be made from clay, stone, or any other material that can withstand the heat required to melt iron. 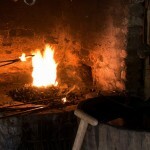 Crucibles are wide, shallow vessels — some were even crafted with handles, allowing easy transfer of the molten metal. The main purpose of the crucible is to keep the ore in an area of concentrated heat to separate it from impurities before shaping. Open-fire forging is possible for Luperci in some cases. 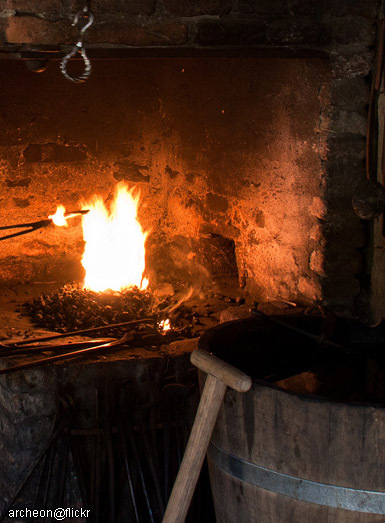 Something like a bloomery forge is fine to build within ‘Souls, and it is most realistic for new metalworkers begin with a bloomery. Bloomeries consist of a pit or chimney with heat-resistant walls made of earth, clay, or stone. Near the bottom, one or more pipes (made of clay or metal) enter through the side walls. These pipes allow air (hot or cold — hot is preferable) to enter the furnace, either by natural draft or forced with bellows. An opening at the bottom of the bloomery may be used to remove the bloom (hot metal), or the bloomery can be tipped over. A finery forge is the absolute pinnacle of technology the Luperci within ‘Souls can achieve, and it would require a particularly cooperative and resourceful group to succeed in such an undertaking. Some more advanced metalworking forges may be operational in Eurasia or North Africa, but finery forging is the extent of ‘Souls Luperci capability. Luperci metalworking is primitive at best. 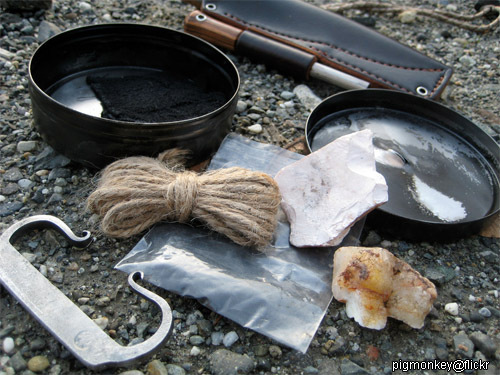 Often used by Luperci to strike fires, a flint and steel fire kit is a valuable trade commodity. 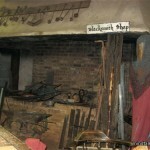 A metalworker’s shop is primitive. Luperci are not capable of large-scale or industrial production. Their techniques are medieval at the absolute pinnacle of their technology. Forges such as this are among the most advanced possible for Luperci. Luperci metalworking forges are small. There are far too many metals to address individually in this guide, but below are some particularly common or useful ones available for Luperci use. All metals are listed with their melting points. Soft metals are especially useable to Luperci. 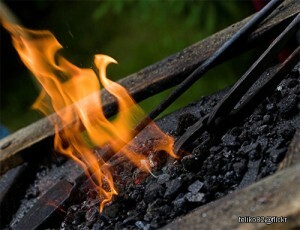 Like blacksmiths, gold and silversmiths can shape the metal while it is red-hot. 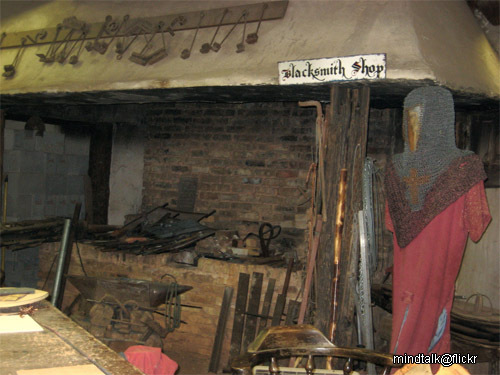 However, unlike blacksmiths, the raw metal is worked at room temperature, with gentle and carefully placed hammer blows, etching, and other shaping techniques. The essence of soft-metal smithing is to take a flat piece of metal and to transform it into a useful object using different hammers, stakes and other simple tools. Occurrence: Gold occurs often in nature, as nuggets or grains in rocks, and in veins in mines. Gold is present in moderate amounts in eastern Canada, with over a million ounces produced in Nova Scotia alone from 1860–1988. Additionally, gold was extremely prevalent in human society: a total of 174,100 tons of gold were mined throughout in human history. 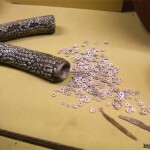 Of course, not all of this can be scavenged by Luperci — some of it will have been used for leafing, computer parts, and in other tiny parts that make the gold non-recoverable. Uses: Gold is the most malleable of all metals; gold leaf can be beaten thin enough to become transparent. As a less reactive metal, gold is well-suited for use in coins, jewelry, and as a protective or decorative coating. Limitations: Gold is too soft for use in weapons. Because of the softness of pure gold, it is usually alloyed with base metals even for use in jewelry. Alloys: Gold is generally too soft for use in functional objects; it is almost always found as an alloy, or used simply to coat something made of another metal. Gold forms alloys with many other metals at high temperatures; common colored gold alloys can be created by the addition of various amounts of copper and silver. Occurrence: Silver is found in mining-viable form, as an alloy with gold (electrum) and in ores. Silver does not occur naturally in eastern Canada, but it was widely used in the times of humanity and can thus be found in abundance in old ruins. Uses: Silver shares many of the same uses as gold. Silver has long been valued as a precious metal, used in currency coins, to make ornaments, jewelry, and high-value tableware and utensils (hence the term silverware). Limitations: Similar to gold, silver is too soft for use in weapons. Silver may also tarnish under certain air conditions. Alloys: Similar to gold, pure silver is generally too soft for producing functional objects. Silver is usually alloyed with copper (“sterling silver”) to give it strength while preserving the ductility and beauty of the precious metal. Occurrence: Copper is not found in nature in mining-viable amounts within eastern Canada. Like silver though, copper was widely used by humans for everything from coins to statues to architecture, and can be readily scavenged from many human structures in the form of wires, piping, and machinery. 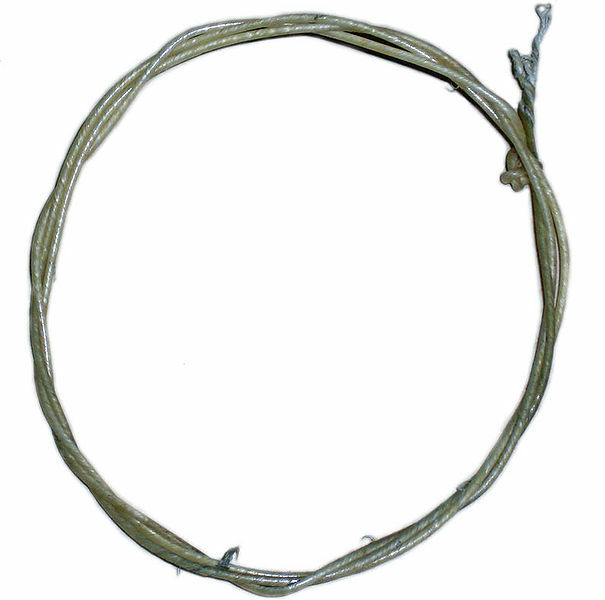 Uses: Pure copper is soft and malleable. Copper compounds are used to create bacterial resistant items, fungicides, and wood preservatives. Copper has been used in roofing to discourage moss growth. Limitations: Copper is also generally too soft for use except as an alloy. Things made with copper corrode to give green verdigris (or patina), though some do not consider this a limitation, but an enhancement. Alloys: Brass, an alloy of copper and zinc (copper and zinc often occur together in ores); bronze, an alloy of copper and tin. Occurrence: Not only are its natural deposits a difficult-to-mine ore, it occurs only rarely in nature to begin with — and nowhere in eastern Canada. The most likely source of large amounts of raw tin are tin recycling plants in the United States; however, coins, metal bearings, decorative items, and many other human things are made of tin alloys. Tin was frequently used as a coating for other metals (e.g., tin cans — which are typically aluminum coated in tin). Tin is therefore fairly abundant for Luperci who are willing to scavenge for it. Uses: Tin is not easily oxidized in air and is used to coat other metals to prevent corrosion. Tin can be highly polished to a very bright, silvery sheen. Punched tin is an artesian form of tin object creation, often used for laterns which cast patterns on walls. Due to its extremely low burning point compared to many other metals, tin is a common metal used for apprentices and inexperienced metalworkers for practice. Limitations: Typical of a soft metal, tin is typically not used for functional items except as an alloy. Alloys: Bronze, an alloy of copper and tin. Occurrence: Lead does not occur in nature; however, it was widely used by humans for everything from architectural and structural elements to machines. Uses: Lead is highly malleable as well as easy to smelt. Similar to tin, lead is used as a practice metal for many metalsmiths. Its low melting point also makes it ideal for casting small ammunition — e.g., sling pellets. Because of its high density and resistance to corrosion, lead is used for the ballast keel (a part of the bottom of the boat used for balance) of sailboats. Limitations: Similar to soft metals, lead is not used for functional items. Additionally, lead is poisonous if ingested. Lead impurities mostly worsen the quality of other metals; although there are exceptions: for example, small amounts of lead improve the ductility of steel. 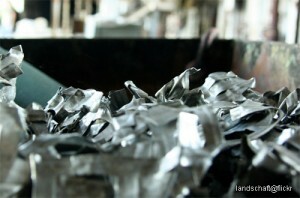 Certain types of scrap metal scavenged from human areas is a valued trade commodity. Occurrence: Although aluminum is the earth’s third most abundant metal, it is so chemically reactive that native specimens are rare. When found as an ore, it is extremely difficult to extract. Natural mining is not possible for Luperci. Thankfully, aluminum also enjoyed widespread human use — it was the most widely-used non-ferrous metal, used in everything from household foil to electronic casings to car components. Uses: Aluminium is remarkable for the metal’s low density and for its ability to resist corrosion. Aluminium has about one-third the density and stiffness of steel. It is easily cast, drawn and extruded. Aluminium mirror finish has the highest reflectance of any metal. Thanks to its lightweight nature, aluminum is best-suited for applications where it is alloyed with another, stronger metal. 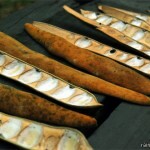 It can be used to create arrowheads and pellets for slings, and in other applications where weight is a chief concern. Limitations: Aluminium, unlike steel, melts without first glowing red. Forming operations therefore require some expertise, since no visual signs reveal how close the material is to melting. Alloys: Aluminum is highly reactive and can create an alloy with many metals as well as other elements. Bronze: The melting point of bronze varies depending on its composition; 950 °C / 1,740 °F is an average. Occurrence: Bronze is an alloy of copper and tin, and occurs in nature very rarely. However, it was widely used by humans — primarily as a decorative metal, having lost much of its industrial use outside of ships and other water applications by the time of the apocalypse. Uses: Bronze is especially suitable for use in boat and ship fittings owing to its combination of toughness and resistance to salt water corrosion. Bronze also has very low metal-on-metal friction and will not generate sparks. Limitations: Bronze is not as easy to process into a useable grade of metal as iron. In general, iron also yields a usable product at a lower quality. Metalworking is a skill that takes many years to master. Occurrence: Iron is the fourth most common element in the Earth’s crust. Exposed to air, iron oxidizes and forms iron oxides, which are pervasive in ores. Iron also occurs frequently as an alloy. Large deposits of iron are found in banded iron formations. These geological formations are a type of rock consisting of repeated thin layers of iron oxides alternating with bands of iron-poor shale. Pure iron is not obtainable by smelting; additionally, pure iron (telluric iron) is found only in Greenland. Uses: Iron has a distinct advantage over the other prominent hard metal, bronze, in warfare implements, as it is much harder and more durable. 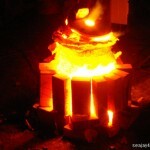 Iron can also be significantly hardened and strengthened during the smelting process by impurities, such as carbon. Limitations: Iron is susceptible to rust. Alloys: The most important alloy of iron is steel. Wrought iron is an iron alloy with a very low carbon content. Wrought iron contains slag, which gives it a “grain” resembling wood, that is visible when it is etched or bent to the point of failure. Wrought iron is tough, malleable, ductile, and resistant to corrosion, though cracks when bent or finished at a red heat. It is strong in tension, and also tough – resistant to fracturing. Wrought iron was not produced on a large scale by humans at the time of the apocalypse, but can seen around older human bridges and boats. Cast Iron is an iron that has been been heated until it liquefies, and is then poured into a mold to solidify. Cast iron tends to be brittle, though there are malleable types as well. Cast iron has a relatively low melting point, good fluidity, castability, and is resistant to deformation and wear. Steel: The melting point of steel varies with its composition; 1370 °C / 2500 °F is an average. Steel can be soft at 538°C / 1,000 °F. Occurrence: Steel is an alloy of iron and a small amount of carbon. It does not occur in nature, and much of the steel used in the time of humanity is not workable for Luperci — they are too complicated or delicate to melt into their natural forms and then reform into useful object, and they often also have extremely high melting points. Contrarily, steel that is created from iron ores is much more accessible to Luperci, although this steel is of far poorer quality. Uses: In its completely hardened state, steel is usually too brittle, lacking the structural integrity to be useful for most applications. Tempering must be used to decrease the fraility. Once tempered, steel is more durable than iron and can replace it in many of iron’s typical applications, including for structural and architectural uses, tools, weapons, etc. Limitations: In human times, it played a large role in the industrial revolution — however, Luperci are absolutely not capable of producing steel on anywhere near the same level as humans. Not only are Luperci limited in their capacity (i.e., steelmills and factories do not exist), steel is also among the most difficult of metals to get right — too little carbon content leaves too-soft, near-pure iron, and too much carbon creates an alloy called pig iron (brittle and not malleable) instead of steel. Not Possible: Although steel has carbon, “high carbon” type steels are not possible for Luperci to create. The method used to create these types of steels was not invented until the mid-19th century. Stainless steel is also not possible for Luperci, as it requires chromium to manufacture. Ancient methods of steel production are available to Luperci: e.g., by heating the ore buried in a charcoal fire and welding the metal together with a hammer, squeezing out the impurities. A water or livestock-powered trip hammer might eventually automate this process for Luperci in Eurasia. With care, the carbon content can be controlled; however, it is important that smelting take place in a low-oxygen environment. 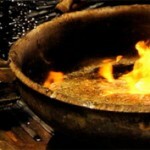 Unlike copper and tin, liquid or solid iron dissolves carbon quite readily, leaving too-brittle wrought iron. Even in the narrow range of carbon and iron ratios that make a steel, a number of different metallurgical structures, with very different properties can form. Understanding such properties is essential to making quality steel, but would take a Luperci a lot of trial and error to figure out. 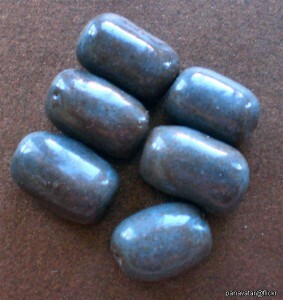 Simple rounded metal beads can be produced by Luperci. Carburizing techniques possible to Luperci use direct application of charcoal packed onto the metal and heating it, and then quenching it — called case hardening. Case hardening is the process by which steel is prepared for use. When the iron or steel is cooled rapidly by quenching (dunking into water to cool the object rapidly), the outer surface becomes hard, while the core remains soft and tough. Because hardened metal is brittler than softer metal, hardening the metal uniformly is not always a suitable choice. Case hardening can provide a part that will not fracture (because of the soft core that can absorb stresses without cracking) but also provides adequate wear resistance on the surface. Tempering, performed after hardening, increases the toughness of iron-based alloys. Tempering reduces some of the excess hardness and is done by heating the metal to lower temperature. Precise control of time and temperature during the tempering process is critical to achieve the desired balance of physical properties. However, holding the work at exactly the right temperature for the correct amount of time is not possible for Luperci (they lack thermometers and timers). Color can be used to judge when the metal is hot enough, but this method of tempering usually requires a good amount of practice. The final outcome depends on many factors, including the composition of the steel, the speed at which it was heated, the type of heat source, the cooling rate, and many other circumstances which vary from smith to smith or even from job to job. The thickness of the steel also plays a role. The tempering process may be repeated over and over again until the desired toughness is achieved. Too little tempering results in a brittle item that may shatter on impact.